It has been reported that Apple has been granted new three new sapphire glass related patents from the U.S. Patent Trademark Office (USPTO) on July 8, 2014. 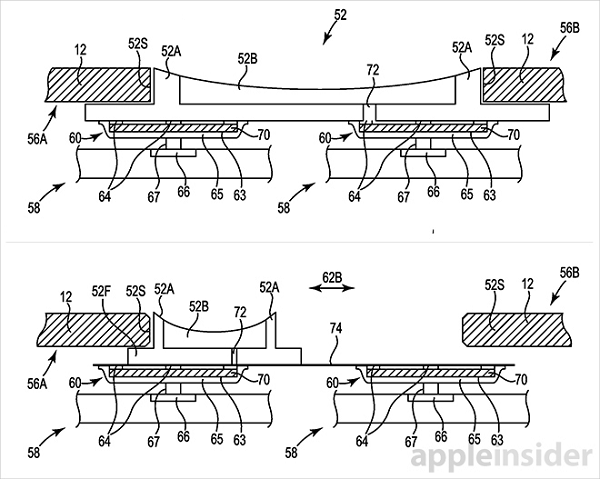 Discovered by AppleInsider, the three new patents cover a method to strengthen weak areas in sapphire display covers, application of sapphire to illuminate buttons, and embedded product details under a sapphire layer. Apple has been rumored to have plans in using strong sapphire glass displays in its new iPhone 6 device. Recent videos leaked seem to confirm this, showcasing iPhone 6 front panels made of sapphire glass being bent and scratched without suffering any damage. The patents Apple has been granted seem to correlate with the video, by providing a method to strengthen areas in the sapphire display cover which are vulnerable to damage, making it more durable. The second patent filed by Apple would provide the company with a method for making buttons, camera, and volume rockers out of sapphire glass, which would then allow physical controls of the iPhone to also be made from sapphire, according to TechCrunch. The iPhone could then also include an embedded LED to light up the sapphire parts of the phone. This technique would allow Apple to construct the iPhone completely out of glass. Finally, the third patent application is for embedding product information markings within the sapphire, such as serial numbers and trademarks. The markings would be visible through the sapphire and not easily worn away. Apple would use an ion implantation method earlier invented by the company, which alters the optical or chromatic property of sapphire, according to AppleInsider. Anticipation has been mounting for the new iPhone 6 which is to be launched this fall. It will be interesting to see how many of the rumors and leaked photos are true to form once the phone hits shelves in a few months.